All smiles for the camera and perched everywhere on the tractor this photograph was taken at Crumlin. 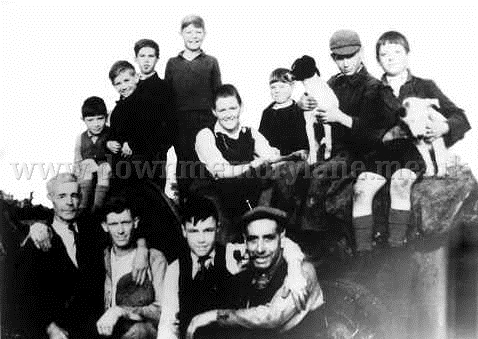 At the front with his arm around his dad is William Courtney, behind him is his brother Roy second from the right with the dog on his knee. Also there is Frank Courtney and Ronnie from Riverside. The year is unknown. 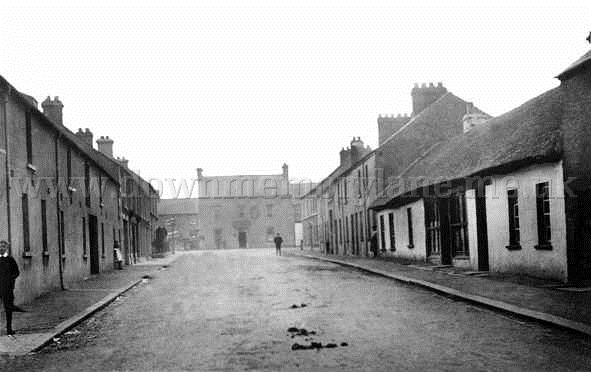 This is the Antrim Road in Crumlin caught on camera back in 1911. It is very unusual to see a road completely clear of cars - but in the foreground you can certainly see evidence that horses had travelled that way! To the right you can see a line of immaculately trimmed thatched cottages and at the top of the street you may be able to just make out a pub. This image was actually used on postcards in the early part of the 20th century and indeed this photo was taken from a postcard sent on June 6, 1912. The recipient was a Master J.Walker, who lived in Fintona. The message read: 'Come along for a ride on the hobby horses, Jack. Hurry back or you will miss all the fun. Did you ever see this view before? Best wishes, Ena'.